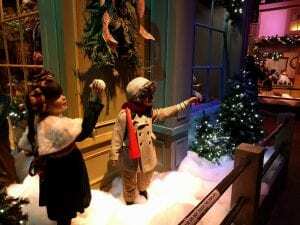 The Enchanted Village is a fun New England tradition and is returning to Jordan’s Furniture for the holiday season! The Enchanted Village opens Saturday, November 17, 2018 and runs until January 1, 2019 and is open 11-8PM on Monday-Thursday, 11-9PM on Fridays, 10-9PM on Saturday and 11-5PM on Sundays. The Enchanted Village is closed on Thanksgiving and Christmas and has a different schedule for Black Friday, New Year’s and other select dates as well. In addition to the Enchanted Village vintage displays, you can also take a picture with Santa and enjoy Enchanted Ice for an additional charge. We paid $20-something for pictures with Santa a few years ago, but they were totally nice about my brother taking pictures in the background. 2015: Went four days before Christmas on a weekday in the late afternoon: no wait. 2016: Went on a Saturday mid-morning the weekend before Thanksgiving (before Santa): no wait. 2017: Went on Friday, December 1st at 11am-ish: 20 minute wait and it was in a line the whole walk through basically. I’m not sure what other experiences are with the wait but I’ve heard the weekends can be long and they have a lot of rope to support that theory. I was actually surprised last year that we had to wait in line given my previous experiences, but maybe I just picked a bad time. They were playing frozen on multiple TV screens at the time, which was a nice little bonus for kids. For more information about Jordan’s Enchanted Village for 2018, please head here. Have you visited the Enchanted Village in Avon before? How was the wait when you’ve been?